Good Wednesday all or shall I say happy hump day to all of you . Today we have a book set in Canada . FULL DISCLOSURE by Beverly McLachlin . 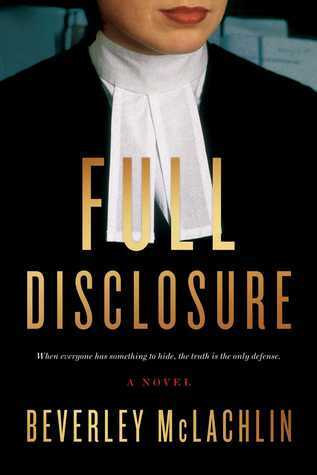 When everyone has something to hide, the truth is the only defense.There’s nothing Jilly Truitt likes more than winning a case, especially against her former mentor, prosecutor Cy Kenge. Jilly has baggage, the residue of a dark time in a series of foster homes, but that’s in the past. Now she’s building her own criminal defense firm and making a name for herself as a tough-as-nails lawyer willing to take risks in the courtroom. I am a sucker for a good thriller so when I found this book I was stoked . I settled down and started reading well late into the night . I just couldn't put the book down . I love that it is set in Canada and I knew the places that the author was talking about . Let me introduce you to Jilly Truitt and up and coming defence attorney . When a very influential case comes up Jilly sets up to defend Vincent Trussardi , she sets out to go to war against her mentor . As she sets to fight, the dark memories of her past of foster homes . She dives deeper into the past and digs up a revelation that will change everyone's lives forever . This book has some amazing characters that are well written and very complex . Jilly is a force to reckon with . She is tough as nails as an attorney but you also get to see a very vulnerable side when she is going through the past . Which she thought she had buried . You cheer for her and you also want to wrap her up in a blanket and hold her tight . Vincent is the perfect antagonist . He is in trouble and needs help but he isn't truthful in any thing he tells Jilly . You will love him and hate him at the same time . This book is set in Vancouver and the author showcases some of the areas quite well . We go on such a journey . The are a couple of things that just kind of slowed it down for me . I didn't really feel much of the thriller part . I wish that it was a little bit more into the mystery and the intrigue of the book . It just felt flat in a few spots where it kind of dragged just a bit. Over all I enjoyed this authors first book and cant wait to read more from them . So if you like great court cases and mysteries add this book to your summer reading list .